Home > 3D Realms/Apogee Software Ltd.
Found 2 file extension associations related to Duke Nukem: Manhattan Project and 2 file formats developed specifically for use with Duke Nukem: Manhattan Project. Developer: 3D Realms/Apogee Software Ltd.
Gaming's king of action returns in an all new adventure, this time in New York City. Duke battles his way across towering skyscraper rooftops and through gritty subway stations on the hunt for power-hungry villain, Mech Morphix. Mutants of every kind are thrown at Duke as he chases down Morphix through eight huge environments and avoids the green slime called GLOPP that is causing all the chaos. But radioactive smile isn't Duke's only problem - there are more than 25 uniquely dangerous mutated enemies hell-bent on making a meal of him. Whether it's Uzi-sporting alligators or ten-foot ball roach beasts - Duke's in town to blast bad guys and save babes. Sure, pipe bombs, a machine gun, a rocket launcher and a pulse cannon are gonna make a goo-filled mess in the Big Apple, but what's a hero to do? 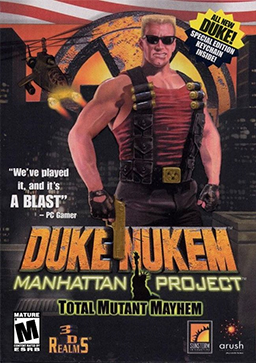 If you need more information please contact the developers of Duke Nukem: Manhattan Project (3D Realms/Apogee Software Ltd.), or check out their product website.